IS IT THE JOB OF AN ARTIST TO EVOKE EMPATHY? WHAT CAN THE WORK OF AN ARTIST FROM 500 YEARS AGO TEACH US ABOUT EMPATHY TODAY? IN 2014, UK ARTIST CLAIRE CUNNINGHAM WAS ONE OF FIVE EUROPEAN CHOREOGRAPHERS COMMISSIONED TO CREATE A DANCE PIECE IN RESPONSE TO THE WORK OF 15TH CENTURY DUTCH PAINTER HIERONYMOUS BOSCH. THE COMMISSION WAS PART OF B PROJECT, A 2016 INITIATIVE TO COMMEMORATE THE 500TH ANNIVERSARY OF BOSCH'S DEATH. THE RESULTING PIECE, GIVE ME A REASON TO LIVE, SHOWS AS PART OF CODA FESTIVAL IN OSLO THIS YEAR. HERE, SHE TALKS ABOUT WHAT SHE FOUND IN THE PAINTER'S TREATMENT OF DISABILITY IN HIS WORK, HOW THIS CONNECTS TO CONTEMPORARY ATTITUDES TO DISABILITY IN SOCIETY AND THE ARTIST'S ROLE IN EVOKING EMPATHY. To be in Bosch’s home town was fascinating and made a lot of things make sense. He lived on the market square in Den Bosch, so he was looking down where everything would be going on – potentially the hanging of criminals, the burning of witches… He was able to see these big panoramas of hundreds of people. From his windows, he would have looked down on this vision and all the sins of life going on at all times of the day. On the first day of the project, the first lecture we were given was by someone who was an expert in the sketches of Bosch. 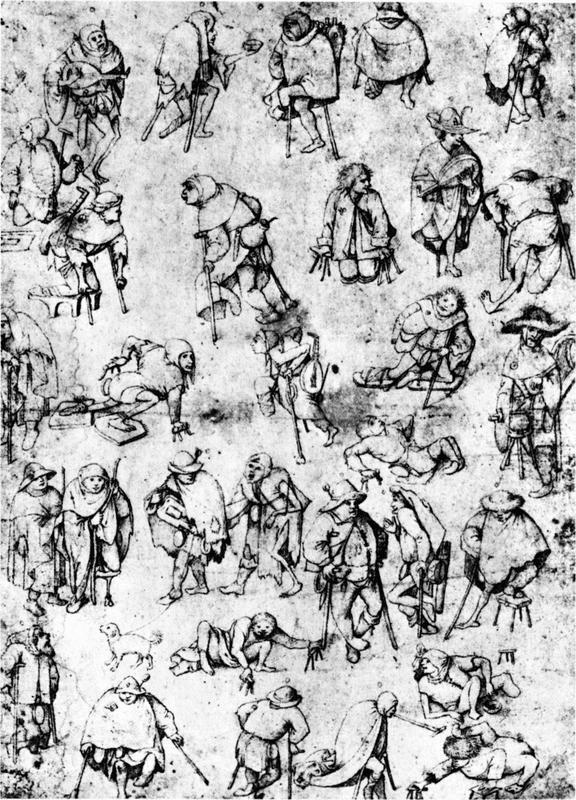 He showed us two sheets that were filled with little sketches of what were labeled in Dutch as ‘cripples’, about thirty of them. They were all men and they were all beggars. So all the beggars were cripples, all the cripples were beggars. I was instantly interested because it was a page of disabled people. The thing that caught me was the lecturer said, and this was purely his own opinion, he was very clear about that, but he suggested that these figures might represent sin. Everything in Bosch symbolises something, but a lot of the meanings are lost because they represented different things in Medieval society than they do in contemporary society. For example, we see eggs as representing fertility but in those days they represented nothingness or emptiness. He suggested beggars might represent sin, but specifically the sin of greed, which I was confused by at first. We’re used to contemporary notions of greed being associated with lots of money or food, so people who had none of those things being a symbol for greed seemed quite strange. But the more I thought about it the more I felt I kind of recognised it as actually a very contemporary portrayal of disabled people. About 2013, I felt I was really seeing in the media disabled people being portrayed as people who were sucking the system dry, taking what they hadn’t earned. This idea of people who don’t work for their money or their support. This notion of people being deserving or undeserving of support. And then I started to feel I actually do recognise that propaganda around disability – it’s also not specific to disability, it’s also very relevant in terms of unemployed people and refugees and asylum seekers, anybody that’s seen as marginalised by society and who is usually blamed when money is supposedly tight. Historically, that was also Jews and Romany gypsy people as well, this whole strata of people that blame is usually allocated to, those who are perceived to not be contributing in an ‘appropriate’ way, so that struck me as quite familiar once I thought about it more. We were also told that the period when Bosch was painting was a time of a lot of paranoia in Europe – it was coming up on the witch trials and the Inquisition and coming up on the turn of the millennium, so a lot of people were paranoid about that as well, thinking the world was going to end. Whenever societies are told that it’s a time of fear, this cycle seems to happen again and again, of society turning on these groups, so I began to feel like this is a cycle that’s coming back. It also then began to resonate for me with the Aktion T4 programme in Nazi Germany. This was a time when people were being told society couldn’t afford certain people, that certain people were a drain on society - that was the sort of propaganda being used. People were labeled as ‘useless eaters’, so they were a waste of food basically. This programme, Aktion T4, began assessing all disabled people and doctors were required to send in medical records and many tens of thousands of disabled adults and children were shipped off to institutions and that is how the Nazis developed the technology for the camps. They tested and refined the technology for the gas chambers by executing disabled people. And it’s a really unacknowledged part of the Holocaust, it’s not talked about publically very much, partly because there is no survivor testimony at all. So there was always a bit of me that wanted to make something at some time that acknowledged this story and what I felt I was learning in the Bosch research seemed to relate to it. The Bosch painting that’s in The National Gallery in London, ‘Christ Mocked’, is the other one that really struck me. It’s unusual for a Bosch painting – it’s a close-up of Christ with four persecutors just before he’s given the cross and made to walk through the streets. There was a shift in directive from the church at the time – they wanted art to start to provoke empathy in the public, they wanted people to empathise more with Christ. I became really interested in that notion of a directive, of how does one provoke empathy as an artist, and that being given as a job. For me then, there was the question of where are the lines between sympathy and empathy and apathy, and as artists how we are manipulating that really, to do a job? And what is the difference between sympathising and empathising… those were the questions that began to affect the material. Do you need to see someone’s face, do you need to look them in the eyes to empathise? Is it how hard somebody seems to work or how long somebody seems to do something? I began to look at the material as maybe being a series of physical tests I was setting myself that an audience had to witness, with that question in my mind: what does it take to make somebody care? Give Me a Reason to Live by Claire Cunningham will be performed at Rom for Dans at 6pm on the 22nd October as part of CODA Dance Festival in Oslo, Norway.